Warren, MI –The massive fan in GM’s aero lab wind tunnel has been cranked up to full blast as GM’s designers and engineers work to optimize the aerodynamics of the Chevrolet Volt as part of the quest to make the breakthrough concept car a production reality. Aerodynamic improvement is a critical step in meeting the range targets necessary for moving the vehicle to a final production decision. The design team, now with its own studio dedicated to the development of vehicles powered by the E-flex propulsion system, has been working with engineering, aerodynamicists and other scientists to develop an energy efficient Chevrolet Volt by optimizing aerodynamics. Aerodynamic drag accounts for approximately 20 percent of the energy consumed in an average vehicle, directly impacting vehicle fuel efficiency. GM designers apply their expertise to address the opportunity to improve the fuel economy of all GM vehicles. In fact, GM offers more fuel efficient vehicles than any other manufacturer, in part due to vehicle design and GM’s aerodynamic development capabilities. GM’s aerodynamics laboratory, located at the technical center in Warren, Mich., is the center of expertise for optimizing the impact of airflow. In addition to fuel economy, range, emissions, and acceleration are all affected by wind resistance, or aerodynamic drag. The cooling of components such as radiators and brakes are affected by airflow, as is cornering capability, crosswind response, directional stability and on-center handling. GM’s aero lab allows for the testing and development of each of these characteristics. Aerodynamics development begins with a 1/3-scale model where basic shape and major features are defined. The model includes a highly detailed underbody and engine compartment. Radiator and under hood cooling flow is developed with computational fluid dynamic models. Simultaneously, computation development takes place to determine aerodynamic drag of design alternatives. Development continues with full-scale models, where shape is refined and optimized for low wind noise. The development process concludes with a vehicle prototype validation of the math-based analysis and physical testing. Founded in the late 1970s, GM’s aerodynamics laboratory was built in response to fuel shortages of that time and the introduction of Corporate Average Fuel Economy (CAFÉ) standards. Test operations began in 1980 with several production vehicle tests that benchmarked the wind tunnel’s performance against other facilities. 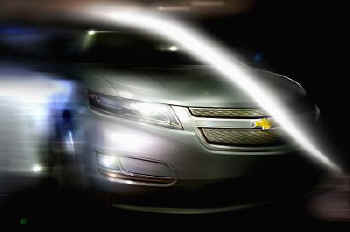 All new GM vehicles for the North American market have been developed using the lab. Today, the experimental work in the aero lab is supplemented by computational fluid dynamics analysis. The combination of the two testing operations provides a powerful tool to improve aerodynamics of future GM vehicles. Wind speed in the tunnel can reach up to more than 120 miles-per-hour. Real-time data acquisition and display systems measure forces and moments, airflow velocities, pressures, temperatures and wind noise. In addition to helping GM create today’s most fuel efficient vehicles, wind tunnel testing has provided a competitive advantage for GM racing vehicles. Several GM sponsored teams also have taken advantage of the wind tunnel, including America ’s Cup challengers, Sunrayce solar cars, bicycle racers, the U.S. Disabled Ski Team and the Canadian Alpine Ski Team. The GM Aerodynamics Laboratory celebrated 26 years of wind tunnel test operations in August. The lab was the first full-scale automotive wind tunnel built in North America and remains the largest wind tunnel in the world dedicated to automotive testing. GM’s history in aerodynamics dates back to the 1930s with aircraft-inspired designs as industrial art. In the 1950s and 60s the company focused more on the science of drag reduction, but in the 1970s, the public demanded smaller, more fuel efficient cars in response to fuel shortages. As a new trend in aerodynamics emerges, GM leverages its heritage and expertise to develop full-sized trucks as fuel efficient as a mid-sized sedan and the next generation of electric vehicles with extended range, starting with the development of the Chevrolet Volt.